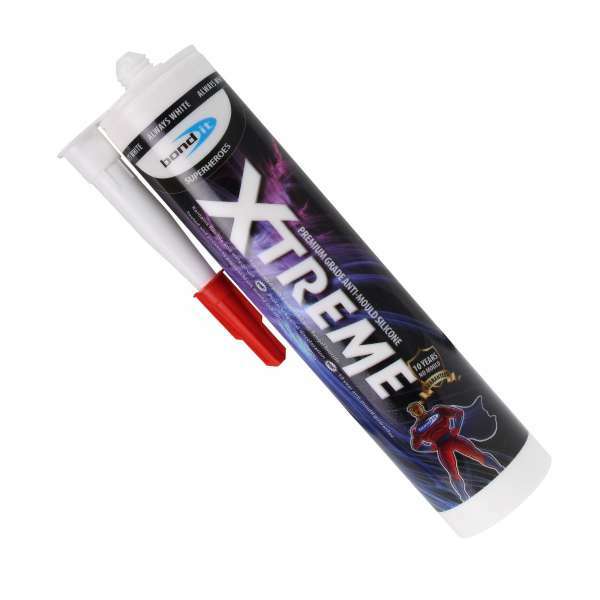 Product information "Xtreme White Anti-Mould Silicone"
Guaranteed to prevent mould for up to 10 years! White, flexible and permanently waterproof sealant that is ideal for sealing in areas of high humidity. Designed specifically for use in kitchens, showers, baths, wet rooms and around sanitary ware and is effective around windows and door frames in areas that have high condensation levels. Xtreme offers primerless adhesion to Enamel, Tiles & Glazed Ceramics, Glass & Polycarbonate Glass (Plexiglass), Stainless Steal, Acrylics and Wood, Stainless steel, Aluminium & Chrome, Concrete & Brick when used in conjunction with a primer. Conforms to ISO 11600 and complies with Material Class B2 according to DIN 4102. Due to the large number of existing paint systems, it is necessary to conduct a compatibility test to ensure suitability. There is also danger of yellowing on contact with white alkyd resin paint. Risk of corrosion when used on bare iron or nonferrous metals. Related links to "Xtreme White Anti-Mould Silicone"
Customer review for "Xtreme White Anti-Mould Silicone"